Nutrition weight loss: Do You Really Need a Multivitamin ? Everyone seems to be an expert on something these days. I myself do not tend to listen to the so called 'experts' as much as I listen to people who have a lot of experience. For example, I am not an expert on MS, but I have a great deal of experience with it...my own diagnosis. I am not an expert on adoption, but I have a great deal of experience in that area too....with my 2 daughters. I am not an expert on emotional and behavior disorders in teens. I do not feel that my M.A. in severe affective disorders qualifies me as an expert. But I do have over 10 years of experience teaching in self contained classrooms with teens with emotional and behavioral disorders. Am I an expert in anything? Probably not. Do I have a LOT of experience in a lot of different areas? Yes. As a teacher, I listen to 'experts' tell teachers how to teach and what the best practices are...many of these experts have never been in a classroom. Now, give me a front line successful teacher with a track record of excellent learning and a B.A or a B.S. and I am all ears. I would listen to that teacher over a Ph.D. who has never been in the classroom. "The National Institutes of Health (NIH) convened a meeting on multivitamin and mineral supplements in May 2006. Experts listen to presentations by other experts for a couple of days, then issue a "state of the science" statement. In this case, the statement was extremely cautious. 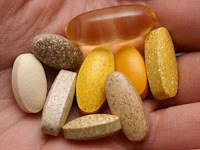 Present evidence is "insufficient to recommend either for or against the use of multivitamin/multimineral supplements by the American public to prevent chronic disease," was the inconclusive conclusion." Dr. Walter Willett, chair of the Harvard School of Public Health's nutrition department, has suggested that taking a multivitamin daily is a form of nutritional insurance. He still says it's a good policy, despite the spate of negative study results. So what to do? Do you need to take one or not? Is it possible to eat a balanced diet and receive all of the nutrients you need? Is there a person in America that eats a balanced diet? "What's special about vitamin D? This fat-soluble vitamin is exceptional among vitamins in three ways. First, it has a unique mechanism of action in the body. Second, you can't get very much of it naturally through your diet. And third, many Americans are deficient in this vital nutrient. That final point is keenly important, in light of burgeoning evidence that vitamin D's health benefits extend far beyond its reputation for building healthy bones. Over the past decade, studies suggest that adequate amounts of vitamin D may lessen the risk of several types of cancer (including cancers of the colon, prostate, and breast) and may also play a role in preventing high blood pressure, multiple sclerosis, and even schizophrenia. And a 2007 meta-analysis of 18 randomized controlled trials showed that vitamin D supplementation may even help people to live longer." After listening and reading what the experts have to say, I do take that into account and then I consider my own experience. Since being diagnosed with MS, I have been looking for alternative natural treatments. I found a liquid supplement that had multivitamins and multiminerals. It also had a detoxifying formula, heart healthy formula, anti aging formula and more. All of this was in one supplement. I could stop spending money on so many different formulas and get 10 formulas in one. I decided to perform my own little experiment to see if I really could cut down on all of the supplements I was taking. I got one bottle for $19.95, a much better price than any other liquid I had tried. I decided to try the recommended dose of 1 ounce for 30 days. It did not take the whole month before I knew that this formula was working. After only 1 week I had more energy and after 2 weeks I felt like a whole new person. I like that it has Mangosteen juice in it too. There have been great studies with mangosteen and MS. I had been buying a bottle of mangosteen but I quit doing that. I only use the liquid supplement. I liked it so well that I have my daughters taking it as well. I only give my youngest daughter 1/2 ounce. She is tiny! So my experience says that taking a multivitamin is beneficial. I have seen too many people benefit from supplements. I know that some experts say that there is 'no evidence' to support taking a multivitamin, but there are those that say it is beneficial. I choose to trust my experience and the voice of experts that make sense to me. I know that I have a healthy diet, and so do my daughters. If that is all we need then why do we feel so good with supplements? Trust your experience too. Yes, I too need multivitamins & I'm taking them through Puritans Pride.